Space shuttle Endeavour has launched on what is the heaviest logistics flight to the International Space Station (ISS). Carrying the “Leonardo” Multi-Purpose Logistics Module (MPLM). STS-126 is a key milestone for the expansion of the orbital outpost into a six crew Station. Endeavour is carrying a MPLM that is packed with supplies for the ISS crew, including a new galley for the station, with additional payload installed into the end cone. The mission will carry out a crew rotation on the ISS, while its EVAs will mainly focus on work relating to the problematic starboard SARJ (Solar Alpha Rotary Joint). Several articles will follow during the mission on the specifics for each flight day. It was yet another clean countdown for the Kennedy Space Center (KSC) team, with only a couple of issues requiring work during the opening part of S0007’s final day of operations. A late concern about a door on the pad was soon cleared as no impact to continue out of the T-9 minute hold. However, the work has only just begun, with engineers already pouring over a huge amount of data – such as flight imagery – to review the performance of External Tank (ET-127) for foam liberation, and all relevant data points of Endeavour’s ride uphill. This process that will last several days, and will gain additional data via the upcoming inspections on orbit. 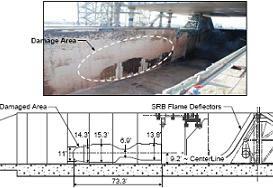 Also under increased focus will be the performance of the repaired flame trench at Pad 39A, which suffered the liberation of thousands of bricks during the previous launch, STS-124 with Discovery. With an array of cameras – some modified via radar and infrared red capabilities – any debris issues during the opening few seconds of launch will be tracked and documented. New sensors embedded into the newly installed fondu frye refractory concrete – that replaced the Apollo-era brickwork – will also provide additional insight. Pad 39A was deemed safe, despite the issues during STS-124, following analysis that showed the shuttle would not be at any risk of being hit by flying debris during a similar event, due to the protection of the Mobile Launch Platform (MLP), along with computational models of where such debris would transport during a similar failure of the pad infrastructure. 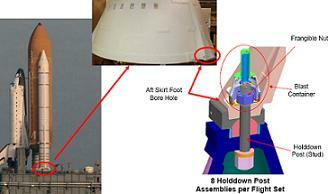 Due to the delay to STS-125, the new modification to the SRB (Solid Rocket Booster) holddown posts debuted with STS-126, via an improved Frangible Nut Crossover System on the holddown bolts/posts, to help prevent aft skirt “stud hang-ups” when the vehicle lifts off the launch pad. A clean separation from the holddown posts avoids potential aft skirt damage to the boosters, with a historical issue relating to ’stud hang-ups’ being addressed with the new modification. A stud hang-up occurs when the stud does not clear the aft skirt foot bore hole prior to the vehicle first liftoff motion (appx 200-250 milliseconds after ignition). A total of 25 aft skirt stud hang-ups at launch have randomly occurred on 23 shuttle launches since program inception, according to historical documentation. The material properties of the new crossover components – now made from stainless steel in the new system – ensures the debris, which can cause reclamping, is no longer a concern when compared to existing, expected debris – previously Inconel material. The other area of modification involved the implementation of a cross-strapping cable to ensure initiation of both booster cartridges. A huge amount of safety improvements have been included into STS-126, ranging from hardware improvements to software advancement. This natural progression of safety enhancements – as listed in several of the 30-plus Flight Readiness Review presentations (available to download on L2) for this mission – will continue all the way through to the final flight of the shuttle. The latest software load for the orbiter flight computers – OI-33 (Operational Increment number 33) – includes safety modifications for engine out scenarios, External Tank separation during a RTLS (Return To Landing Site) abort, and the orbiter’s ability to return to Earth unmanned. The RTLS ET Separation Enhancements debuting on this mission weren’t, thankfully, required. The ET itself was of particular interest after several engineers noted a suspect noise from within the tank, heard shortly after its arrival inside the Vehicle Assembly Building. This kicked off a major investigation to ensure the tank did not contain Foreign Object Debris (FOD), which is a risk via the potential for ingestion into the engines. 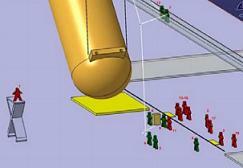 A total of 15 engineers were present in the VAB when ET-129 was being lifted for its placement in the checkout cell. Interviews with all of the workers found that only five of them at ground level actually heard the noise as it was being tilted from a horizontal to vertical position. Regardless, inspections via borescope and X-rays found no evidence of FOD in the tank, with flight rationale showing that in the unlikely event the debris was missed, it would not be able to transport through the tank’s plumbing into the Main Propulsion System (MPS) or Space Shuttle Main Engines (SSMEs). Looking to the future, STS-126 will also debut two new sets of instrumentation, aimed at gathering more detailed data on RSRM (Reusable Solid Rocket Motor) behaviour during the first stage of launch. The resulting data will benefit the efforts to understand and mitigate Thrust Oscillation on Ares I.
Endeavour and her crew will move into Flight Day 2 on Saturday, which will focus on the opening inspections to the orbiter’s TPS (Thermal Protection System) via the OBSS (Orbiter Boom Sensor System).